Youth Corper win MTN's N50million House - Corpr! 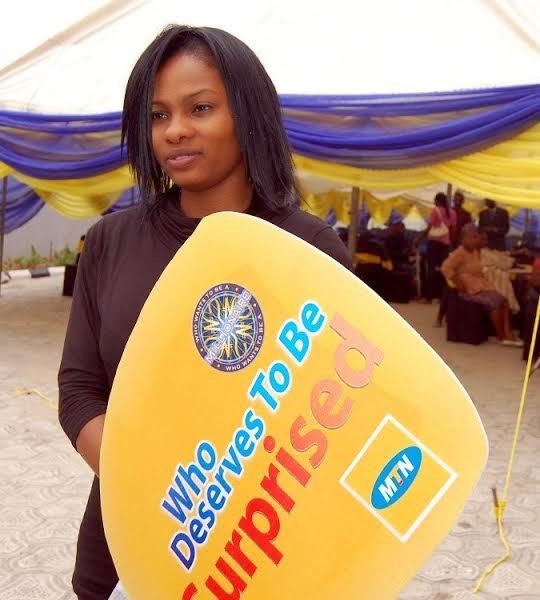 Omotola Akinsola, a serving youth corps member, has won a house worth N50million naira in the on-going Season of Surprises campaign by MTN. Miss Omotola, an indigene of Oyo State is the founder and Director of Jumpstart Academy – an N.G.O focused on teenage and youth development in Ibadan was nominated by Mayowa Daniel for her laudable community projects in the state. The MTN sponsored weekly TV game show, Who Wants To Be A Millionaire (WWTBAM) took a new dimension over the weekend, as sponsors MTN, rode on the platform to give out a house worth N50million naira to a deserving winner. Special episodes of the TV game show tagged “Who Deserves To Be Surprised”, were aired on TV stations all over the country on the 21st and 28th December 2014, to the amazement of many viewers. Sponsors MTN, had called on Nigerians to nominate whoever they feel deserves to be surprised during this yuletide. Such a person, they said, must have influenced or touched their lives in a positive manner. According to the organizers, many nominations were received in this regard and it took a painstaking process to select the eight nominees with the most compelling stories, to come and have a chance of making it to the hot seat, not only to play for the regular star prize of N10million, but to also have a surprise chance of winning a house worth N50millon, courtesy of MTN. Of the eight nominees who were invited for the show, Omotola Akinsola, and Mrs Iyabode Olasumbo Sodiya-Dawodu were the lucky two, who made it to the hot seat. 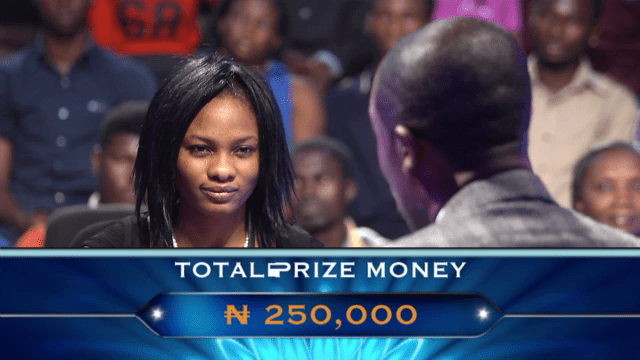 Omotola Akinsola made it to the hot seat in the first episode and won a sum of N250,000, while Mrs Iyabode Olasumbo Sodiya-Dawodu tried her luck during the second episode and also won a sum of N250,000. With both contestants at par, show host, Frank Edoho, ushered viewers into another anxious moment, as both Omotola and Iyabode were made to play the fastest finger game, so as to determine who wins the star prize of a N50m house. Omotola’s joy knew no bounds as she was announced winner, after being the fastest of the duo, to answer the N50m question. In an emotion laden voice, Omotola, expressed her happiness as she thanked MTN for surprising her in such a wonderful way. “This surprise largesse is an encouragement for me to do more and to follow my passion to a point that will influence the youth, even at a global level”, Omotola said. 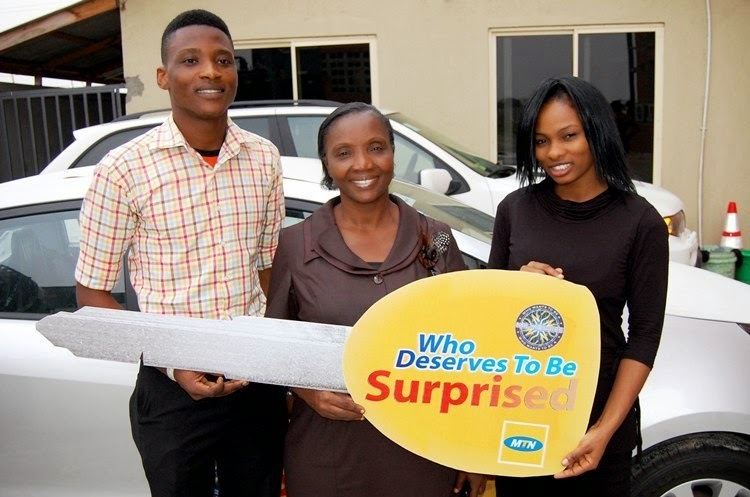 Not done yet, MTN had another surprise package for the runner-up, Mrs Iyabode Olasumbo Sodiya-Dawodu, as show host, Frank Edoho, announced to the delight of the viewers, a surprise gift of a brand new KIA car to be presented to her. While expressing her joy at winning the car gift, an obviously elated Iyabode said it all came as a surprise to her, as she never envisaged it. Omotola Akinsola is a Director at Jumpstart Academy, a Non-Governmental Organisation that supports and currently sponsors more than two hundred and fifty public secondary school students in the area of counseling and tutorials. According to her, she recruits mentors from various universities within the country, to help in achieving her aim of motivating the youth in the society. Surprisingly, it was for this reason that Omotola was nominated for the “Who Deserves To Be Surprised” show by her friend, Mr Mayowa Daniel, who said he was moved by the passion, dedication and sacrifice that Omotola has displayed so far, in motivating the youth in the society.